"The nation's 1,132 community colleges enroll nearly half of all undergraduates in the U.S.–just over 13 million students. Community colleges are centers of educational opportunity. They are an American invention that put publicly funded higher education at close-to-home facilities, beginning nearly 100 years ago with Joliet Junior College. Since then, community colleges have been inclusive institutions that welcome all who desire to learn, regardless of wealth, heritage, or previous academic experience. The process of making higher education available to the maximum number of people continues to evolve at 1,167 public and independent community colleges–1,600 when branch campuses are included." 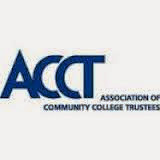 The American Association of Community Colleges (AACC) and the Association of Community College Trustees (ACCT) write in support of HR 485, the National Nurse Act of 2013. We represent over 1,100 community colleges offering nearly 900 Associate Degree in Nursing programs, where the majority of the nation's registered nurses (RNs) have chosen to earn their nursing degrees. Our colleges, recognized for a decades-long commitment to ensuring RNs are available to care for patients in communities nationwide, are equally committed to meeting current workforce needs for nurses prepared for practice and leadership in community and public settings. Your proposal–the National Nurse Act–to appoint a representative from the most trusted profession in America (nursing) in a high profile leadership role offers great potential to increase the effectiveness of the Public Health Service as well as to generate interest in the nursing profession. Community colleges are particularly heartened that the National Nurse Act includes nursing education, recruitment, and career strategies to address the nation's need for nurses, as our colleges have been unable to consider many qualified enrollment applications due to shortages of clinical placement sites and faculty. We welcome the opportunity to work with you to address these and other challenges to meeting America's healthcare workforce needs. We commend you for the introduction of this important piece of legislation, and readily lend our support. Elevating the role of nurses and nursing science will serve to strengthen the profession and bring light to the needs of students and training providers. We thank you for your support for our nation's nurses, and look forward to working with you to pass the National Nurse Act of 2013.